Planoptically polished for the highest image quality. Only 10nm FWHM with a 93% transmission rate. Perfect for planetary observation producing very high contrast levels. For many objects, the Baader O-III reveals a level of intricate detail that rivals the best deep sky photographs, the Baader O-III perfectly isolates the two doubly ionized oxygen lines (496 and 501nm), through a very sharp and narrow bandpass . 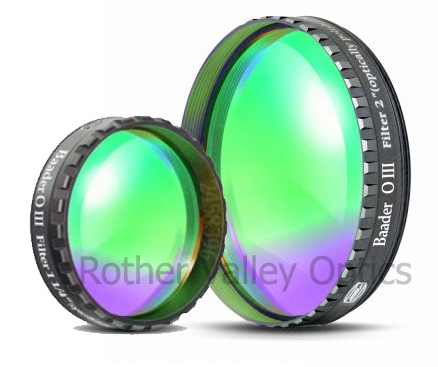 Unlike other O-III filters, the Baader O-III completely blocks longer and shorter wavelengths, this is why some O-III filters appear red, instead of the correct 500 nm Teal color. The result is the highest contrast achievable in an O-III filter.